Conveniently located just beside Mactan Cebu Airport, the stopover promises to be your perfect starting point around the must sees of Metro Cebu and beyond. We are just a few minutes away from the shopping centers, offices, restaurants and other tourist spots. 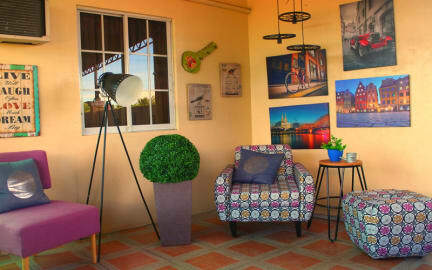 This is just a basic hostel and does exactly what you need. A place to sleep before a flight. HOWEVER, I forgot my headphones there and emailed them to see if they found them. They did, and not only did the spend time emailing me back and forth for days but they helped ship them to me in Singapore (of course, on my dime). I’m super thankful for this and it was definitely going above and beyond. It saved me $$ on buying new Bose headphones. Thank you Janice for the trouble!! 10/10 best hostel we’ve ever stayed at. Booked for 2 weeks and could’ve stayed longer. Geo and Chas were amazing hosts who loved to socialize and do activities with us. The hostel has something going on everyday which is nice if you’re traveling alone because you get to meet some incredible people who will turn into lifelong friends! Definitely do the island tours they put on- the food was amazing & so was the rum;) and join in on the family dinners, Geo cooks some bomb food! Perfect for a quick overnight close to the airport - check in was easy and friendly. This is nothing fancy, but it suited its purpose for a good nights sleep with a warm shower. Perfect for a stopover. Close to the airport. This hostel came out to $20 USD per night and we needed something close to the airport for a 3am flight. If you are spending no time here and are just sleeping it might do the job. The bathroom had NO toilet paper and there are no towels provided to shower. We used the toilet in a restaurant nearby before coming to sleep. There was only 1 blanket provided for the private room and there were two of us on separate beds... the AC did work. It was gross honestly. Really cheap and ok for one night before our flight home. Wouldn’t stay here again. It was super hard to find. The taxi drove around the neighborhood forever before we found it. The room had AirCon which was good. There was a big security wall in front with cameras, so I felt safe. But honestly the part of town we were in, you would definitely need all of that! The location is close to airport but very sketchy. It seemed to be run by all 19 year old boys. They were not inviting, and didn’t seem cleanly. The room overall was basic and okay. But no where to lock stuff or have a key to get into room. Overall even though convenient, a very unsettling location and atmosphere.